UPDATED!!! Onechot now a target of chavismo!!! Through Juan Cristobal (I would have never stumbled upon such a video on my own) comes a most impressive Zeitgeist-y video by Venezuelan artist Onechot. In English, Reggae like. Rotten Town from El Flying Monkey on Vimeo. 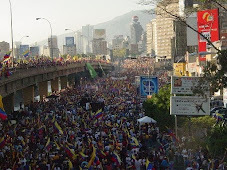 A video of great impact and a rallying cry against the evil oppressive Chavez government. Lies are lies and truth is truth, though some who claim to be against this regime would subvert the opposition message with excessive criticism and doubts. But the singer simplifies and clarifies, with the strength and transparency of a quality diamond.. This is a great view from the street as well as a great piece of film making. I hope they make more soon. If you can, comment on Vimeo, it helps encourage the outlets that count to pick it up. If you know the makers, help them if you can. This makes one think of Fredrico Garcia Lorca and others who wrote in the many other violent times in the Latin world. As I wrote, I do not know enough about recent music to be of much help and I am just retransmitting Juan Cristobal great trove. darn it covers very quickly many facets of Venezuelan society and culture. Very well done from all aspects music, video and message. Beauty, BB, the rich, the poor, the politician with the expensive suit, the agony and at the end we are all affected and responsible at some level. No matter were you live you are affected.